There are a ton of cryptocurrencies around, some of them more legit than others. If you are a serious trader, you need to do your homework, study charts, and keep a close eye on price changes. 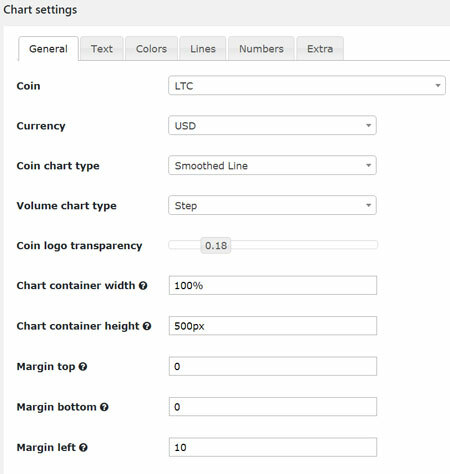 Thanks to Cryptocurrency Charts for WordPress, you can include interactive charts on your site. It covers Bitcoin, Ethereum, Litecoin, Monero, Ripple, Dogecoin, and many other currencies. The plugin lets you view historical performance of all coins against each other to identify arbitrage opportunities. You can change chart type, width, height, top, bottom, and other settings in the backend. You get line, smoothed line, column, and step chart types. This plugin lets you display cryptocurrency quotes in many major fiat currencies. FinancialTechnology is behind this script.